Welcome to our tenth week of our first encounter Medieval Monday theme. Are you still commenting on our blogs to be in the running for our giveaway? Let’s hope so. I’m happy to welcome Ceci Giltenan and her snippet from Highland Redemption. Happy reading and don’t forget to leave her a comment! Tomas remembered Father James. He was exceedingly kind and Lady Katherine had adored him. Tomas had known he must have surely passed away by now, but his heart ached a little anyway. Almost without thinking, he made the sign of the cross and said a silent prayer for his soul. Follow along next week on Elisabeth Hobbe’s website: https://elisabethhobbes.co.uk/. 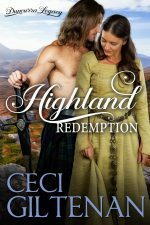 Remember to leave a comment for a chance to win an e-copy of Highland Redemption or another e-book of your choice by Ceci Giltenan. You can also find my next snippet from For All of Ever at CeCi’s blog here. Just from the small snippet, I get the impression that Tomas is a good man. Poor Tomas! This would be difficult to have gone through. But I Know he will persevere and come through! Really would live to read! Thank you Sherry and Gigi! He is definitely in an odd spot. I guess Laird Ruthven wasn’t very involved in raising his daughter (fortunately). How do you pronounce laird, anyway? The funny thing is, Laird Ruthven WAS involved in raising his daughter. Having his own child changed him. Always good to have a praying man! I like them that way…so most of my heros are men of faith.